As the entire nation looks to drive people towards the digitalization, the Haryana state government took the strong initiatives to make things available on the government related works in online. By doing to the state people would able to enjoy the easiness of doing the government related work at east and quicker than past. 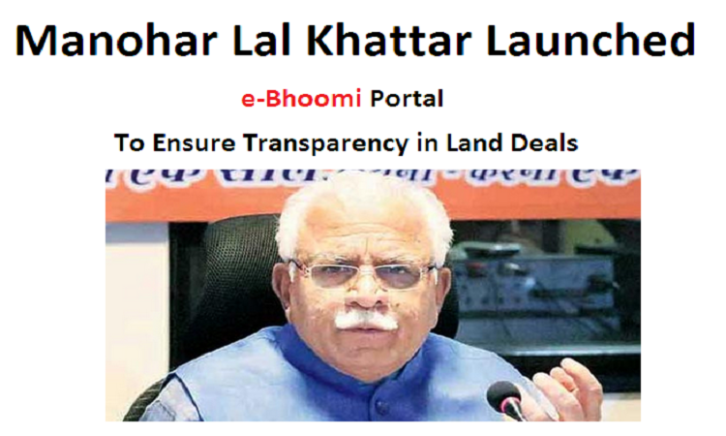 Recently, the chief minister of Haryana Mr. Manohar Lal Khattar launched the “e-bhoomi portal” and makes the land procurement carried by the state people are done at ease. Just like the other digitalization process carried in all government departments, the process of sale and register of lands in the state too gets digitalized by the launch of ‘e-bhoomi portal’. The e-bhoomi portal launched by the Mr. Lal recently provides the more transparency on the works carried by the government offices regarding the property registrations. The main purpose of this newly launched e-bhoomi portal is to help the governing body which is the state government of the Haryana as the being its own land bank. The e-portal will helps state owned HSIIDC (Haryana State Industrial and Infrastructure Development Corporation) to accumulate the lands needed for the government projects which are being offered by the land owners voluntarily. This new portal helps farmers to make decision making after analyzing the government projects and make them to point the sites needed for the project developments. Moreover, this e-bhoomi portal makes things much easier and get rid of the complexity involves in the land acquirement at hassle-free in the state. This beneficial online portal was launched by the current chief minister of the state Mr. Manohar Lal Khattar and it is mentioned that the e-portal site and also the entire procedure carried by the portal will be fully supervised and governed by the HSIIDC. This newly launched e-portal for land procurement process in the Haryana state will make things much easier for acquiring lands for the development projects by the government. Since, the entire process carried in online there will be more transparency when it comes to selling or buying lands. Also the e-portal has the unique features by which the land owners especially the owner of the non-farming field can able to offer their lands to the development project of government voluntarily. In order to make sure the best outcomes in the land acquirements in-between the buyers and sellers of the lands, the HSIIDC ensures the convenience for both parties in the portal. The entire system is designed in such a way that the normal man can easily access the government works on the land purchasing work right from their home. And also it makes things easier for the farmers to handle their distressed land sales on their own. The e-bhoomi portal gives the authentication for the farmers to make their own decision when it comes to land procurements process and make the procedure more transparent to public by making it in online. The managing director of the HSIIDC Mr. Sudhir Rajpal, quoted that there will be public announcement will made regarding the land procurement process by the relevant department and the farmers can make use of its within next 30 days from the announcement by visiting the e-bhoomi portal. The registration process is quite simple and respective farmers would get a unique service request number in SMS mode where they can easily track the works related to their land acquirement. Under this newly launched e-bhoomi portal both the buyers and sellers would be able to make hassle-free deal, and the digitalization helps the buyers and sellers to get access with the land procurement process in their smart phones by the help of its own mobile application. Without any intermediate in the land procurement process, the buyers can able to get their own price and it helps them to get reasonable price for their lands from the sellers. And for sellers it will be quite easy for them to get things done with the buyers in straight. On sorting out the difficulties of the land procurement process in the state, the state government of Haryana done a great thing by launching this e-portal where the state farmers and land owners gets the power of fixing the price for their lands by their own.